Pradeepa Murugapillai is smart in her army uniform. The black pottu on her forehead gives her a conservative look despite her wearing the knee length tight skirt and black military shoes. The 21-year-old girl, with only an education upto Ordinary Level and a low paid factory worker earlier, is now a professional soldier of the Sri Lanka Army (SLA). She is among 100 Tamil girls to become soldiers of the SLA. Drawing a decent salary, the girls have become latest attractions in their villages as they go on leave wearing the latest fashionable clothes, shoes and bags in town. They, who are smart even in their walk and their dealings with problems among villagers, have attracted the young girls and boys. They see a change in these girls; some of them are going home with their own Honda – Pleasure bikes after three-months of training in the Army. 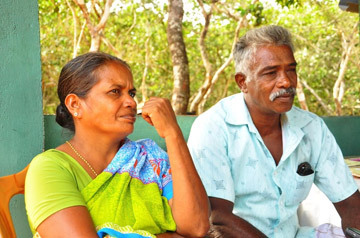 Displaced several times, suffered under constant LTTE threats and herded from Kilinochchi to the last patch of the now defunct LTTE – Puthumathalan, Pradeepa and her family escaped the LTTE terror despite the strong warnings not to flee. “We were kept as cattle under them. We were not allowed to move and always surrounded by the terrorists”, she recalled the terror filled incidents four years back. Her family was ‘tagged’ by the LTTE as a Mahaviru family after her elder brother’s death in a battle against the Army. He was snatched by the LTTE when he was a minor. The attempts by her parents to bring him back home were not fruitful and finally the underage boy came home in a sealed coffin. “They didn’t take me because of my brother but I have seen so many small girls and boys being conscripted by the LTTE. Though we were a mahaviru family, we got nothing”, Pradeepa said. Like many other youth, she also thought soldiers were enemies who harmed young girls. “It was what we were taught by the LTTE and even our parents who have not had any interaction with the Sinhala soldiers. We didn’t know the reality. We had not met Sinhalese people earlier. Resettled in her own village – Ramanathanpuram – in Kilinochchi, today she draws a monthly salary of Rs.30,000 and save half of it while many of her friends are doing odd jobs for very low daily payments. “My parents gave me the consent to join the SLA but some of the villagers had a different view about us earlier. But now they know the reality that we are doing well and earning a decent salary”, Pradeepa said. She said she is happy that she could join the SLA, which is a pensionable job plus other benefits like medical allowances and loans. “Mata oney corpal kenek lesa promotion ekak ganna (I want to get a promotion as a Corporal)” she said in fluent Sinhala, which she learnt when she was working in a garment factory in Colombo. She said negative opinions about Tamil girls joining the SLA is now receding as some of the Sinhalese workers in development projects got married to Tamil girls and leading good lives. “Sinhalese husbands treat their Tamil wives well and they are having good married lives, so the villagers like them now”, Pradeepa said. Kartheepa Premakumar of Mankulam spends her entire salary from the SLA to look after her sister (15) and brother (13) as their both parents are no more. Her parents died in the Mullivellivaikkal in May 2009, just two days before the deadly war came to an end. The three younger children surrendered to the SLA with their elder brother, who is now married and resettled in the same village. “We have a small house and my sister and brother live there alone. I have to look after them and their education. I save a little money also,” she said adding villagers tried to prevent her joining the SLA claiming SLA is not a safe place for Tamil girls. “But now they know we are doing well. I am happy to be a soldier”, Kartheepa, who did her O/Ls while in the welfare camp for displaced people, said. In a grand ceremony held in Kilinochchi in end 2012, over 100 Tamil girls came with their parents to join the SLA. It turned a new page in the SLA history as it was the first time over 100 Tamil youth were recruited to the Army. Over 200 Tamil girls from Kilinochchi applied to the SLA but after a round of interviews and medical tests 109 were selected for the training. After completion of their basic training these girls are now deployed at the 5th Volunteer Force Women’s Corp.
Maj. Shyamin Perera, Commanding Officer, said the girls are trained well in civil-military coordination and deploy them in most of the community based projects in Kilinochchi. “They have a good relationship with the villagers. This is another measure that the SLA has taken to change the mindset of the people who were used to see a soldier differently. When their own girls speak to them and work with them, the image of the soldier will give a positive outlook”, she said. Initially, some parents and villagers, who were misled by some Tamil political parties, were up in arms against recruiting Tamil girls to the SLA. “Since these soldiers are doing well with the people and also earning a good salary, many more girls want to join the Army now. People have a very positive image about these girls and the SLA” Maj. Perera said. According to Maj. Perera, these Tamil youth are talented than other female recruits in completing the training and also the courses. They follow a course in Sinhala and English Language, nursing, beauty culture, dress making, home gardening, computer and performing arts. “Most importantly they are given courses on personnel hygiene and personnel development, to turn them to professional soldiers”, she said, adding 100 girls completed the training course than the expected duration. Maj. Perera said at the initial stages it was the language barrier that disturbed the training schedule but with seven interpreters, 36 instructors and 14 Tamil speaking soldiers assisted in overcoming the issue. “Now they speak well in Sinhala”, she said. The Lessons Learnt and Reconciliation Commission, which was appointed by President Mahinda Rajapaksa to look into the root causes of the national problem, has recommended to recruit more Tamils into the military as there are few in the forces and this has resulted in calling the SLA as ‘Sinhala only Army’. Suppaiya Udayageethan, a fisherman from Wattakachch, was at the visitors room at the 5th Women’s Corp camp to meet his daughter Renuka. She studied upto grade 10 joined the SLA with the blessings of her parents but amidst of strong protests of the villagers, who thought the army soldiers would harm the Tamil girls. “The villagers even came to assault me to stop me from taking my daughter to the recruitment day. I tolerated and told them that they will realise the truth soon”, Udayageethan said while his wife was saying: “Mata hari sathutui duwa gena (I am very happy about my daughter) in Sinhalese. The 58-year-old father of six children said parents are happy as their daughters were able to secure a government job, which is pensionable. “The Army helps our villagers a lot and they built our house worth over Rs. 2 million. We have electricity now”, he said. Udayageethan said they had brought murukku and some other sweets to their daughter, her friends and the female officers in the camp. Security Forces Commander Kilinochchi, Major General Udaya Perera is the brainchild of recruiting Tamil girls to the SLA and he got the blessings of the Secretary Defence Gotabaya Rajapaksa and the then SLA Chief General Jagath Jayasuriya for the recruitment drive. “After I assumed duties, I thought of giving more responsibilities for the women soldiers in the 6th Women’s Corp as there are hundreds of widows and young girls who needed support to live”, Maj. Gen. Perera said. The female soldiers who were only doing office work had given more projects to empower women in the Kilinochchi district, in which living standards were very low. My girls launched projects on vocational training, gardening, beauty culture, and taught them even hygiene and sanitation, improving leadership qualities. When they first approached these women, they had poor responses but it was improved slowly. I am happy to say my girls have been able to win confidence of these women who ignored them at the beginning. Through these projects – home gardening, horticulture, bees honey project, ornamental fish and growing fruits – women in Kilinochchi started earning. When their income was growing, the bond between these women and soldiers also grew. The most popular project was beauty culture and that attracted a large number of young girls and young widows. With the popularity of the women soldiers in the villages due to their work in villages, I got several requests from young Tamil girls to join the Army. After a series of consultations with the Defence Secretary and the Army Commander, we started recruiting them. Over 500 girls came for the first interview and after a lengthy three-months selection process, including medical tests, 115 girls who had best qualifications got selected but only 109 girls reported for training. After a three-months training 95 girls passed out as Army soldiers. During the three months of selection process, these girls had the chance to decide their future with the Army. During the training only nine dropped out and this is very less compared to the drop out rate in the South. There is no question of forceful recruitment of these girls and today they are happily engaged in their duties while following several courses – Sinhala and English Language courses, computer and leadership programs. This is also another accusation by the local politicians who view this as a disadvantage for them when the Tamil girls are doing well and drawing a salary of more than Rs. 35,000 with all other perks on par with Sinhala women soldiers. They are also jealous of these Tamil girls getting popular among their communities. When the parents and other family members are well looked after by the Sri Lanka Army, these politicians again run out of slogans for their political survival. They are afraid of these projects which lead to reconciliation among the communities and they spread rumors to disrupt the unity among people. When they levelled this allegation I challenged them to come up with a package of Rs. 50,000 for these girls but no one came forward. After their passing out, 45 girls went home in their own motorcycles, which they obtained through a soft loan of Rs. 200,000 granted by the Commercial Bank. Imagine, girls who didn’t have anything to eat at home, are going home with a motor cycle after three-months of training in the Army! Earlier, they were very backward and had a suspicious eye on everything they saw. But now when you see them, from the appearance you can talk volumes about them. They are smart women soldiers now and engaged heavily in civil affairs in their own villages. Their story tells about the transformation of humble village girls to professional soldiers.